I was asked by a reader for some curry dishes. I just started getting into cooking Indian food about a year and a half ago. The flavors are wonderful, but they can be too spicy for me so I tended to avoid preparing them at home. I can only eat mild (on the Scoville scale) foods. Don’t get me wrong, the food I cook is full of flavor, but you won’t be diving for the sour cream or milk products to put out the fire in your mouth.. That is until my son starting saying Indian food was one of his favorites kinds of food. And he love hot spicy food. So I have learned to make a great flavor base, and taste that so it works, then I add in the heat. At that point, my son becomes the taster. I embraced the new challenge to recreate some of the dishes my son enjoys. Given how fast he eats them up, I guess I am doing something right. I am going to put a disclaimer that while I use typical Indian spices, these are not to be considered authentic Indian dishes. They may be close, but I always put a little spin on them that may not be traditional. It is still a great dish and embraces the concept. The first thing I did was research Indian cuisine and understand the common spices and herbs. I then purchased those that I was missing and started experimenting. I have found that some of the spices I never really used before, such as cumin and cardamom, had cross over applications to other types of international foods and even American food. I have to say it was fun discovering new flavors different ways to prepare dinner. Before I go into recipes, let’s look at what you may need in your pantry to turn out these dishes on command. The spices. 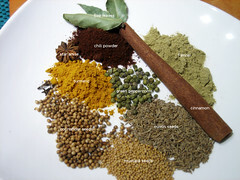 Curry powder is not a single spice, it is a blend of spices. Not all blends are the same, curries differ by region as well as by family to family or chef to chef. You can buy pre-packaged curry powder at the grocery store or you can make your own. Basic ingredients in the curry powder are below, the amounts of each varies and those variations can turn a mild tasting curry into a HOT spicy curry (more cloves, cinnamon, red pepper) or add a touch of sweet (Garam Masala blend). Toast any seeds in a dry pan on the stove top over med heat until they start to lightly brown and their aromas are released. Shake the pan or stir often to avoid burning. About 2 minutes. Allow to cool and place all in a spice grinder and blend. Or use a mortar and pestle and grind until you have a fine powder. If using a cinnamon stick, you may need to use a fine grater and grate it or cook with it and remove it before serving the dish like you would a bay leaf. Mix all together in a bowl or jar. The optional items listed above are just that. If you like a little cinnamon, add in the cinnamon. Or if you don’t have one of the optional ingredients, it is OK to leave it out. The amounts provided are basic recipe amounts. If you really want to spice it up – add more pepper and cloves. Sweeter, user a sweet paprika. For a smokey flavor – opt for a smoked paprika or a smokey chili powder. Taste test before adjusting if you are just becoming familiar with the spices. You can take a small amount from a spoon.. or an even better way – mix some with a little sour cream and taste that way. Adjust as needed. When you come up with a mix you like. Make a big batch and store in a jar with a lid. This will make it quick to add flavor to week night dinners fast. If you notice – there is no salt listed in the ingredients. This is because, depending on how you use the powder, your other ingredients may already have enough salt content. Also – there is a ton of flavor in these spices, you may not even need salt. If you are just starting out with curry, there is nothing wrong at all with purchasing the pre-packaged curry mixes in the store. I used these spices for many different things, so investing in the individual ingredients make sense for me. I also need to vary the spicy heat and the individual ingredients lets me control the flavors and heat levels as needed. But I also have pre-packaged curry mixes that I use as a base and adjust with more of the above when needed. It’s a good idea to have some of the below in the pantry as well, as they are commonly used in creating different curry dishes. The applications are endless. Below are some recipes I have created. I am going to list the amount of curry mix to use – not the individual curry ingredients. Use the recipe above as a base to create your favorite mix and combination or use a favorite store-bought mix. I just made this tonight.. It was sooo goood. No left overs from this dish. * You can also follow this recipe for chicken, bone in and skin on is best for roasting for flavor and to keep the moisture in as oven cooking tends to dry out meat. ** Note – the brine is great to use for pork and chicken as it helps to keep the meat moist. However, if you are short on time, then you can skip the brining process. Just be sure to keep an eye on the temperature of the meat so as not to over cook it. You can pick up a quick read thermometer pretty much anywhere. Take it out about 5 degrees less than your desired doneness. This is because once you remove it from the oven, it will continue cooking. 2 cups Jasmine rice – follow directions on the bag/container to cook. At least two hours before prepare the brine. The correct way to create the brine is to bring all ingredients to a simmer over med heat to dissolve the sugar and salt. Then let completely cool before pouring over the meat/seafood or you will end up cooking the meat/seafood. That is the correct way.. however, when I am in a rush – I just toss all in a ziplock bag, press out excess air, squish a few times, put in the meat/seafood, squish around a few more times then put into the fridge. Every 30 minutes or so, squish it around a little more. About 20 minutes before cooking: Preheat oven to 375, remove the pork from the fridge and remove from the brine. Rinse off and pat dry with paper towels. On a plate, mix 2 TBS of the curry and salt. Roll the pork loin in the mixture. Be sure to get the ends and the entire surface is covered. Set aside. Start the rice (Jasmine). This is great to serve over rice. Once the rice is on the stove. In an oven proof skillet, heat 2 – 3 TBS of olive oil. When HOT, sear the pork loin on all sides (about 20 seconds on each side). Be sure to sear the ends as well. Transfer the skillet to the oven (if you don’t have an oven proof skillet, Transfer the pork to an oven proof dish – SAVE the oil that is in the skillet for making the sauce). While the pork is cooking (about 15 – 20 minutes – remove when internal temp reaches 157 – 160 degrees), prepare the sauce ingredients: In a bowl, combine 1.5 – 2 TBS curry with sour cream and heavy cream, salt, fresh ground pepper and thyme. Let sit until ready to make the sauce. Keep an eye on the rice to be sure not to over cook or burn. It will finish cooking by the time you remove the pork from the oven. When the pork is done (be sure to use an oven glove when removing the skillet from the oven. I have made that mistake and its no fun! ), remove from the oven and immediately remove the pork from the pan and transfer to a cutting board. Let it sit and rest while you make the sauce. If there is more than 1.5 TBS of oil left over in the skillet (can happen depending on how fatty the meat is you are preparing), pour out excess. Pour in the sour cream mixture and whisk to combine. Let simmer about 2 – 3 minutes until thick enough to coat the back of the spoon. Now all you have to do is slice the pork loin (or just serve the chops or chicken as is), top with sauce and add rice to the plate (and more sauce if you wish). If you wish, you can season the rice with curry powder as well. Just add 1 TBS to the rice at the beginning of the cooking process. Give it a quick stir after the water comes to a boil and then again just before serving. This recipe is very versatile as you can choose to make it vegetarian, vegan, or full on meat/seafood. It is a tomato based stew, typically served with rice, orzo (rice like pasta) and/or naan bread. And with all curry dishes you can make as hot or mild as you wish. I am going for a bit of heat in the below recipe and will mark the items that can be omitted if desired. This is more involved. Not difficult, but has a number of steps. in a large sauce pan, add 2 TBS canola oil. heat over med heat. Add onions and carrots. Saute until the carrots start to get soft and slightly caramelize (about 5 minutes). Add in the Habanero and jalapeno peppers, garlic, ginger and curry paste/powder and saute for about 2 – 3 minutes stirring occasionally. Transfer mixture to a food processor or blender, add in the vinegar and blend until smooth-ish and a paste forms. Set aside. Season the protein if needed with salt and pepper. Add 2 TBS of oil back to the same pan. Heat over med-high heat until the oil is hot and starts to simmer. Sear the protein on all sides and until mostly cooked. Remove from the pan and set aside. In the same pan, add back the mixture from the food processor/blender and tomato paste. Saute for about 3 minutes, stirring occasionally. This process will really meld the spices together. Add in and raw bell peppers and cauliflower, and saute for another 2 – 3 minutes. You will need to stir more often now to prevent burning. Next, add in the stock and canned diced tomatoes (and chuck steak or Sausage if using). Stir well combining all ingredients (the cauliflower will continue to cook). Reduce heat to med heat and let the mixture simmer for about 10 – 15 minutes. The liquid should reduce by about 1/2. Add in the coconut milk, stir to combine. Let simmer another 5 minutes. Taste, add salt and fresh pepper if needed. Add the protein (chicken, shrimp, scallops, tofu) back into the mixture and cook a last 3 minutes. Taste again, add cilantro and adjust seasoning if needed. Serve over rice, orzo or with a side of warmed naan bread. Enjoy. Did that curry turn out a little to HOT? Well – no problem, just add some of the cooling sauce or dip your bread and eat it that way. Traditionally this is made with yogurt, but you can substitute with Sour Cream. Cut the cucumber in 1/2, scoop out the seeds. Using a grater, grate the cucumber on the medium-sized holes. When done, dice the strips into a small dice. Put the cucumber in a strainer over a bowl and sprinkle with salt. Let sit about 20 minutes to reduce the liquid. Then put into a strong paper towel, and squeeze out extra liquid. Mix all together in a bowl. Taste and adjust seasoning if needed. Refrigerate at least two hours or over night until ready to serve. This is very easy to make. The longer you let it sit in the fridge the better the flavors develop. Over night is best. Mix all in a bowl and refrigerate at least two hours before serving. Will last several days in the refrigerator (depending on the expiration date of your sour cream). Serve with vegetables, chips, bread. It can also be added to cooked dishes to enhance the sauce. I hope this gets you started on your way to creating wonderful curries at home. I enjoy experimenting with these different spices and my son LOVES what I make. That is the biggest battle. Keeping things a little new and fresh making dinner interesting. I now have a few new staples I can add to my repertoire to turn dinner out fast on week nights and some that take longer that I can use on the weekends. Posted by culinaryease on January 30, 2011 in Cooking for two or less, General Cooking, Recipes, Vegan/Vegetarian and tagged Curry, Curry powder, Indian cuisine, Turmeric.